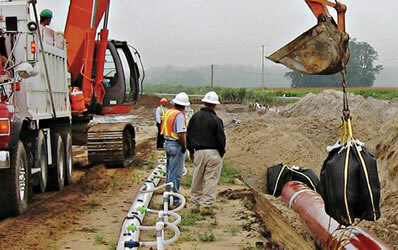 Cross Country Pipeline is a dealer for geotextile bag weights and concrete weights from PiepSak. PipeSaks are manufactured from the heaviest grade fabric in the industry. The (400 GSM) “geotextile grade” fabric is made for buried application – signified by the black colour of our fabric. Pipesak annually certifies “All” their components - fabric, webbing and thread, to meet a minimum 4x safety factor. PipeSak geotextile pipeline weights are a soft buoyancy control, allowing the pipeline the ability to move slightly while still maintaining negative buoyancy and coating protection. PipeSaks are as permeable as the ballast used to fill them, allowing groundwater and cathodic protection an easy path. PipeSak's non-biodegradable polypropylene fabric is filled with local gravel, making them as environmentally friendly as the natural stone used to fill them. Low product price, reduced handling costs, and use of local gravel as ballast combine to make PipeSak the most economical pipeline weighting system. PipeSaks are also cheaper to install, requiring no extra trench depth, less trench dewatering, and conforming to most trench bottoms. PipeSaks are non-biodegradable and can easily be removed if ever required.PipeSaks can be installed with a single lift hook, which can be released without workers in the trench. With their stable, low design, PipeSaks can be installed on to a floating pipeline without risk of tipping — requiring no trench dewatering. Contact our at 303-361-6797 to configure a solution that works for you.